Brand activism is an interesting and relatively new phenomenon. From companies being vocal about LGBT rights and other social justice issues on social media, all the way to some even backing particular politicians - more and more we see companies taking a stand on social justice matters. Brand activism lies in that sweet spot where awareness and marketing strategy intersect. When it’s done right, it can be a positive force for change, and a powerful advertising technique. Businesses often have huge reach. The really big names boast substantial social media followings. We drive past their billboards daily. Our wardrobes are home to their promotional merch. When businesses start to champion particular causes or challenge harmful stereotypes, that messaging reaches a large audience. Raising awareness through cause-related marketing can potentially be really influential. Business hold in their hands a powerful tool for social good with brand activism. For decades businesses have been building corporate social responsibility profiles - but brand activism - or “cause marketing” represents something entirely different. It sees many companies center issues of social justice at the core of their brand messaging. They take up clear political positions, even at the risk of alienating some of their customer base. So why is this such a popular marketing strategy that businesses are openly embracing? It’s not just altruism. Social impact branding has struck marketing strategy gold. Using a footballer or celebrity in your advertising campaign just can’t compare to tapping into arguably the most powerful factor in customers’ lives: their morals and values. Naturally, this kind of marketing can successfully generate that desirable and elusive thing: brand loyalty. This is the powerful factor that means a business can build a base of repeat customers. Aligning your brand with social justice issues is an incredibly impactful way to emotionally connect with customers. It’s a means of relating to the public on the aspects they hold most dear. Cause marketing is also a clear response to the interests of a particular target group: millennials. The rise of “woke” culture means we live in an age where issues on race, gender, sexuality and justice are very openly discussed and embraced. Cause marketing is merely a reaction to this. Brand activism isn’t just a way to relate to your customers. It also lets them know that they’re not simply buying a product, they’re supporting an organisation that has a positive impact on the world. For socially conscious consumers, this means they can put their money where their mouth is. If buying from your company is the more moral choice, that can be a powerful way to stand out from the competition. And the opposite is true too. By not aligning with social justice issues, you allow customers to turn to competitors who wear their values on their sleeves. That’s not to say cause-related marketing is without controversy. It definitely isn’t. Many slogan-emblazoning, justice-championing organisations have recently been called out for hypocrisy, being tone-deaf or appropriating causes for their own gain. Inauthenticity when it comes to social impact branding isn’t just unethical - it’s also poor marketing. We have seen time and time again how businesses that have failed to strike the right chord in their messaging have received a fierce public backlash. It’s clear that social impact branding isn’t just a quick marketing fix. It has to be consistent with contributing a net positive impact on the world. 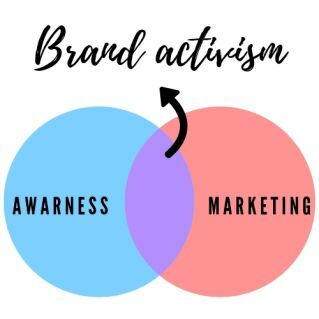 Brand activism is an incredible phenomenon in that it can make use of the influence of businesses to raise awareness about critical issues, while the business in turn receives the marketing benefits of aligning with those issues. Wondering how your own business can get involved? You don’t need to be on the extreme end of the social impact branding spectrum to experience the effects. There are some simple choices your business can make to better connect with your customers - and more effectively raise awareness! A great place to start can be choosing promotional products that are consistent with your company values. For example, we offer a series of “proudly South African” products, that are locally manufactured and support South African industries. This sets a powerful example to buy local, and protect our country’s industries. Or choose from our range of eco-friendly products. We offer spekboom plant desks, recycled stationary, reusable steel straws, solar powered power banks, and a range of innovative green products. This is a great way to spread awareness about the environmental issues you care about, and align your business with green habits. Brand Innovation is a leading supplier of corporate gifts and promotional products in South Africa. We are happy to give you product ideas consistent with your branded messaging, or suit your company’s budget. Start spreading awareness about the issues you value. Please do not hesitate to get in touch, by contacting via email or on 0861 111 954. One of our account executives will be happy to help you. We look forward to assisting you! Goodie bags for sports events is a practise we won’t be letting go of any time soon! It’s not a just a fun addition to your event, goodie bags for sports events are a really smart marketing strategy. Giving participants branded merch to take home is a powerful way to spread brand awareness for your event and sponsors - and to keep them coming back! Participating in a sports event can often be a grueling, physically demanding activity. For one thing, a goodie bag shows your participants that your appreciate their attendance and all the hard work involved in the run up to the event. Goodie bags for events also allows for the “Been there, got the T-Shirt” factor. The branded merch of a goodie bag is a trophy that everyone receives for participating. It’s evidence of your participants’ endurance and tenacity. And if attendees are tempted to splash your products over their social media, all the better for brand awareness! Goodie bags are also a great people pleaser. After all, who doesn’t love receiving trendy, useful items for free? It adds a delightful cherry on top of your event for your attendees, and can even be a pull factor to keep them returning year after year. A prepackaged branded goodie bag also adds to the sense of significance of the day - that this is something special. Goodie bags for events are mood boosters that can really positively contribute to the success of your event. Goodie bag ideas - need inspiration for goodies to fill your swag bag? Browse our giveaway products page for a vast range of fun and novel goodie bag ideas. There are a couple of factors that make for really great corporate gifts to ensure your gift bag isn’t abandoned at the back of a wardrobe, or left behind at your event. Most of all, branded merch should balance being useful and fun. The best gifts really add value to participants lives, so they hold onto them to fulfil a purpose. Keeping in mind that your participants are active, outdoorsy people, our range of sports and wellness gifts are also a great source of ideas. Some options include sunblock, a protein shake, runner arm pouch, skipping rope or exercise mat. A branded t-shirt is always a well-received item in swag bags for events. Sports apparel is a great twist on this - one that really caters to your participants. Swag bags for events are also an opportunity for you to really get creative! A banal or dull swag bag just won’t have the same impact as one full of interesting, cool goodies. The digit ring grip and stand, branded USBs, or adhesive silicone phone card holders are great examples of useful nifty promo items. Products like bubbles and fidget spinners, are also fun and trendy items to add a lighthearted touch to your swag bag. Goodie bags supplier - we offer a bright selection of giveaway bags - a great eye catching way to ensure your branding draws attention. Brand Innovation is proud to be a goodie bags supplier. We can source and brand your giveaway items, and offer packaging services. We also offer door-to-door delivery nationwide. So you can focus on your successful event, while we take care of the goodie bags process from start to finish! To chat to an account executive about any queries you might have about our goodie bags, please feel free to contact us via email or on 0861 111 954. We look forward to assisting you! Why are promotional products so powerful? There are a range of marketing techniques available to businesses. What is it about promotional products and corporate swag that makes it such a successful method? Ideally, the end goal of marketing is to lead the customer down a path of purchase from your company - there are some key reasons promotional products do that most effectively. The strength of promo products lies in their tangibility: customers hold the products, engage with them, use them in their daily lives. They’re a long-term form of marketing, that is integrated into the day to day of your customers. This factor has an extremely positive impact on 5 metrics of successful marketing: reach, recall, resonance, relativity and reaction. Reach: according to the research of Promotional Products Association International (PPAI) 89% of consumers have been given at least one promo product in the last six months. This is a huge proportion of the consumer population! Because promotional products are so cost effective, their effects are widespread. They can really scale up your brand exposure. But it’s not enough for products to just reach customers, they should make an impact on the consumer. Promotional products are especially good at this. Recall: the PPAI’s research tells us that promotional products are a really memorable form of marketing. Resonance: we also know that power of promotional products is that they resonate with consumers. 82% of people had a more favourable impression of brands whose promotional products they received. Relativity: relative to other forms of marketing, promotional products are rank the number one most effective channel to prompt action in customers. Where as other advertising forms work better for different generations, promotional products are the most powerful marketing channel across all generations. Reaction: promotional products effectively prompt a reaction in customers. The power of promotional products is in how effectively they lead a consumer down a path of purchase. Their impact in terms of reach, recall, resonance, relativity and reaction makes them an excellent advertising channel. It’s a high impact, cost effective marketing channel. Brand Innovation is a leading supplier of promotional products and branded corporate goods in South Africa. Browse our promotional products catalogue to see our full selection of customisable items. To get in touch please leave us an email or call us on 0861 111 954. This is why the corporate branded mug is such a popular choice. your logo and colour underneath. This makes it such an effective promotional product: it actively engages the owner with your branding while your logo is magically revealed! Entertaining and fun, the colour changing mug is as functional as other branded mugs. It’s a fresh and innovative branded product idea, making a real impression on your customer. Transition Colour-Changing Mug: This coffee mug is made of ceramic and is a stylish matte black when cold. It reveals the printed logo beneath when warm on a white background. Chameleon Colour Changing Mug: This product comes in a trendy two toned designed, packaged in a matching gift box. It’s available in 5 different colours, allowing you to customise your mug in colours consistent with your brand identity. To order branded colour changing mugs, please email us or call us on 0861 111 954 - and one of our account executives will be happy to chat to you about the branding options available to you. For our full range of mugs on offer, please see our Ceramic Mugs page. For a staff member out in the field, or making their commute in winter - a softshell jacket offers welcomed warmth! Their strength is in balancing protecting you from the elements and allowing ease of movement. These products are bound to get used in colder weather, making them an excellent vehicle for branding. They make professional functional corporate uniforms for employees, and effective luxury giveaway items. With minimal, sleek designs, they make way for your branding and customisation. These renowned brands offer a sophisticated and stylish corporate clothing option for the winter months. Maintaining uniformed professionalism and warmth can be a tricky one when it gets cold! These brands are your corporate clothing solution. To see our softshell jacket options, please go over to our Jackets catalogue. Contact us on 0861 111 954 or email us to chat to an account executive about the softshell jackets we supply and the branding options on offer. Corporate uniforms aren’t just a great tool for brand awareness and promoting your brand, they have a ton of other benefits too. They affect how your company image is perceived by its customers and clients, and can have an impact on the psychology and productivity of workers. Brand exposure: Corporate Uniforms are a really great way of increasing your company’s brand exposure. Branded clothing functions to increase the visibility of your brand, because your logo goes wherever the wearer does. In the workplace, while commuting, or at networking and promotional events, the corporate uniform functions like any company swag. Especially for companies with different branches, a consistent corporate uniform ensures that customers engage with your brand at every point of interaction. Consistent corporate attire: A uniform ensures that your team are consistently professionally presented. This is important, as business attire affects your image as a company. Professional presentation sens the right impression to your customers, and clients. Corporate uniforms don’t necessarily have to be a full outfit. A branded golf shirt, for example is an excellent uniform item - comfortable, while still professional. Team building: a uniform is a very visual symbol of unity in the workplace. It equalises employees and can promote a sense of camaraderie amongst workers. The feeling of being in a team is an important component of loyalty and company pride. Appropriate corporate attire is not as rigid as it used to be - different levels of formality are fitting for different industries and workplace cultures. An increasingly popular choice for branded corporate attire is golf shirts. These are perfect for the professional world, as they are lightweight, comfortable and understatedly sophisticated. Because they have minimal designs and are available in so many colours and weights they’re very customisable to your brand identity. We supply over 150 different styles of golf shirts! Another popular option for the modern workplace is the lounge shirt. This is a great style of office wear, and their stylish simplicity make them an excellent corporate uniform item. Available in short sleeve, ¾ sleeve and long sleeve styles, they allow your uniform to look consistent regardless of the season. Brand Innovation are uniform suppliers in Cape Town. We don’t just source and supply branded clothing in the Mother City - we deliver door-to-door anywhere in South Africa. As uniform suppliers in Cape Town we supply conti suits, high visibility clothing, bush shirts, lounge shirts, pitt shirts and golf shirts. Go over to our Corporate Clothing catalogue to browse through our full selection. To chat to an account executive about branding services on offer and available products, contact us via email or call 0861 111 954. Promotional bottles make it convenient to consume our most basic necessity for survival. And if your customers are drinking anywhere near the recommended 2 liters of water a day, that’s a lot of daily interaction with you brand! This is the kind of item that you want keep on hand. So your logo comes along to the gym, into meetings and stays in arm’s reach on office desks. A bottle is a convenient product for everyday usage. A perfect cost effective giveaway item, you could also kit out everyone in the office with a branded water bottle. This kind of branding for all the point of interaction with customers and clients is a great vehicle for increased brand exposure. Promotional water bottles are an especially great choice for the health industry - it’s a really fitting promo item for gyms, medical aids, hospitals and pharmaceutical companies. Make it easy for your customers to maintain daily healthy habits. Assisting them with the everyday aspects of healthy living lets them know where to come for the more significant health problems. Branded reusable water bottles are understandably a popular corporate branding choice. Make sure yours stands out, with our range of unique and trendy bottles. Stainless steel water bottles are part of our extensive metal drinkware range. Still a lightweight product, this is a cool sleek metal alternative to plastic bottles. Many of our stainless steel water bottles are double walled, so they’ll keep your drinks cool and refreshing. Our metal bottles with gold finishes are a fun and different option - to help your brand literally shine! A powder-coated bottle gives a sophisticated and modern appearance to your water bottle. An infuser water bottle is an innovative way to have a flavourful, healthy drink. Spice up your daily water by adding fruit to your infuser water bottle. The water draws out the flavour of your fruit for a fresh, tasty and aromatic means of hydration. Our infuser water bottles are part of our plastic drinkware range. This is an inventive and different water bottle choice to catch the attention of your customers. Brand Innovation has a varied range of drinkware, with several branding options. Please contact us via email or on 0861 111 954 and an account executive would be happy to give you ideas for promotional water bottles. We look forward to helping you! Unique promotional products - living in the age of information, your customers are inundated with media and marketing on a constant basis. In this increasingly competitive world, it’s important to make your customers sit up and pay attention to your brand. Unique promotional products are an amazing way to give your brand that essential edge to distinguish you from your competition! The classics of promotional items definitely have their place. They still play a vital role in your marketing campaigns to increase brand awareness. But exclusively doing what everyone else in the industry is doing won’t help your brand stand out. Our selection of unique promotional products offers you the novel and innovative products to get your customers talking around the water cooler. We have some ideas of how you can go about choosing a creative promotional item that is totally unique. Unique company swag - a great route can be choosing items that have a fresh approach to traditional swag products. We offer branded pens that double up as memory sticks - adding a tech savvy flair to a popular product choice. A colour changing mug or chalk mug is a novel twist on the classic corporate mug. Our USBs shaped like a credit card are a convenient, fun alternative to a standard memory memory stick. Creative promotional ideas like these build on the universal utility of classic gifts in an original way. Creative promotional products solve problems or a fill a lack in our lives in a new and original way. They’re items that still add value to our lives, through their functionality. We hold onto them even beyond our initial delight, because they make our lives more convenient. So creative promo products offer a long term branding solution. The most powerful promotional products don’t just delight the receiver. They get them chatting to their friends about your gifts. They get posted over social media. Word-of-mouth is a marketing mechanism that should never be underestimated, and a unique company swag is a fantastic way to prompt it. Unique promotional items - getting creative with your promotional products, isn’t just about shining the spotlight on your brand. It also sends an important message to your customers about who you are. It’s a reflection that your business is innovative and current. That you’re not focused on trying to keep up with trends, but rather that you’re the trailblazers of the industry. Promotional products already have leverage over other marketing forms. Most of the marketing we see is through a screen. It's abstract and virtual - a blip on our newsfeeds. Promotional products are an incredibly powerful marketing tool because they buck that trend. They’re a tangible item that we get to physically interact with. Few other forms of marketing prompt such a level of engagement. Creative promotional ideas - a great way to choose creative promotional ideas, is to respond to the trends or current environment of your customers. For example, we’re recently becoming more conscious about the harmful effects of disposable plastic on the environment. A branded reusable straw is an amazing gift that confronts this contemporary issue. If you’re in the water-stressed Western Cape, promotional hand sanitizers are an amazingly relevant and useful promotional gift. Brand Innovation is proud to be a leading supplier of corporate gifts and promotional products in South Africa. Our vast range of options has a wealth of unique company swag to help your brand make its mark. If you’re still in need of a little inspiration, our account executives will be happy to provide you with unique marketing ideas suited to your budget and promotional goals. Please don’t hesitate to get in touch via email or on 0861 111 954. We look forward to helping you! What Makes Spekboom So Special? This unassuming succulent that litters our backyards and the Eastern Cape landscapes is much more than the humble plant it appears to be. It’s actually a fire-resistant, global warming-fighting, water-wise, oxygen-producing miracle plant! Indigenous to South Africa and super resilient, the spekboom is the green superhero combating greenhouse gasses and climate change. And on top of all this, it’s a low maintenance plant that thrives in everything from droughts to floods. Sounding too good to be true? It’s not! Let’s take a closer look at what makes spekboom such an exceptional plant. While of course all plants are good for the environment - spekboom is on another level! For one thing, it will purify the air around you and survive on the most minimal of water. So it’s the perfect low impact plant for a water stressed South Africa. But the most important quality of spekboom is the contribution it makes to fighting climate change. It takes in way more than its fair share of carbon from the atmosphere, the problematic greenhouse gas that contributes to global warming. This process of removing carbon from the atmosphere is called carbon sequestering, a function that spekboom does crazy efficiently. One hectare of spekboom, can sequester between 4 and 10 tonnes of carbon in a year! This is 10 times more carbon sequestered that the Amazon rainforest! This has uniquely huge potential for combating climate change. And this need is more urgent than ever! In October 2018 the United Nation’s Intergovernmental Panel on Climate Change (IPCC) released a groundbreaking report saying we need to achieve zero carbon emissions by 2050 to prevent irreversible damage to the environment. So spekboom contributes to combatting a much larger global issue - all from our backyards! A spekboom is an eco friendly gift like no other, with real potential to contribute to a more sustainable future. Like many succulents, spekboom is a badass resilient plant that can survive almost any conditions in South Africa. It’s fire resistant so can serve as a firebreak, and requires little water, making it a super low maintenance plant. It can thrive in poor quality soils and survive droughts, fires and floods alike. So even for those of us that are neglectful gardeners, spekboom can survive when we forget to water them here and there! Unfortunately not all of us were blessed with a green thumb. But spekboom is one of those incredibly easy to maintain plants, for even the most hopeless of gardeners. It’s easy to plant, simple to propagate and needs minimal watering. It’s true! Not only does a spekboom gift mean giving someone a beautiful plant, it’s also providing them with some tasty graze. It’s slightly lemony and tart in flavour, making it a favourable addition to salads, garnishes and soups. A favourite ingredient for many chefs, spekboom is also packed with nutrition and vitamins. Spekboom can make its way into the home in a variety of forms. It’s a charming indoor plant, and is a popular bonsai choice. Because it's so easy to propagate, one spekboom gift can result in a whole garden of the plant! They can grow up to 5 meters in height, meaning it can make a great hedge, ground cover or a garden shrub. Spekboom is ideal for coastal regions, but it can survive pretty much anywhere besides heavy frost areas. So no matter the season or climate, this is a well suited gift! Spekboom is an incredibly resilient plant, and is able to live for more than 200 years! This is a long term gift that keeps on giving - for centuries! We will in fact be survived by our spekboom, which will continue to make a positive contribution to the environment long after us. This is an eco friendly gift that has a really long term and powerful impact. Brand Innovation is proud to supply spekboom, as well as other corporate plants and eco friendly gifts. Please contact us on 0861 111 954 or email us and an account executive will be more than happy to help you! Corporate summer gifts: as the holidays near, we see the arrival of warm weather and even hotter products! The festivity of Summer makes it an important season for promotional campaigns and marketing. It also brings with it a great range of promotional items, bound to get a lot of use while your customers enjoy the summery days outdoors. If you’re looking for little inspiration, you’ve come to the right place! Don’t miss out on this season’s selection of corporate Summer gifts. Whirlwind desk fan: keep your heat levels down and your productivity up with a desk fan. Perfect for warmer days in the office, this fan plugs into your computer via USB. It has ample room for prominent branding. Find it on our mobile technology page. These sunblocks can be fully branded in colour. Mosquito repellant: summer brings with it that infamous insect - the mosquito. Keep them at bay with our mosquito repellent gifts. Mosquito Repellent Lotion 50ml: this lotion is another great travel gift. It’s biodegradable, non toxic and organic. The best corporate gifts are those that are useful, trendy and fun! Fulfill your customers' Summer needs with these great branded products. To chat to our account executives about corporate summer gifts available and your branding options, please email us or call 0861 111 954 and we’ll be happy to help!